President Donald Trump continues to gain favor with the Russian government and he’s doing so by blaming poor relations between the United States and Russia on the USA. Jake Tapper on Monday morning shared a tweet from the Minister of Foreign Affairs of Russia. As President Trump has increased his attack on U.S. allies in the European Union, he has continued to praise Vladimir Putin. In a tweet sent out this morning, the President blamed the “Rigged Witch Hunt!” for a poor relationship with Vladimir Putin’s regime. Trump has also attempted to blame Barack Obama for Russian meddling, tweeting that the former President didn’t take hacking seriously, a claim that has been debunked on numerous occasions by various organizations. Trump’s messaging matches the Russian government’s own claims that Obama somehow orchestrated the U.S. election attacks. It’s an odd claim considering Obama’s own party ended up losing the election. Every U.S. intelligence agency and the Senate Intelligence Committee have agreed that Vladimir Putin issued the orders to hack the 2016 U.S. election. U.S. officials largely disagree with the President, noting that “Russia’s interference in the 2016 U.S. presidential election, use of a nerve agent on British soil and aggression in Ukraine and Syria have worsened relations,” according to the Washington Post (paywall). Trump’s tweets come at a troubling time in his overseas visit. The President is meeting today in Helsinki with President Putin and is expected as some point to meet with Putin while no aides are present, breaking from U.S. tradition during high-profile meetings. Putin has already played Trump for the fool, showing up for their meeting 50 minutes late as the POTUS waited for his Russian counterpart to show up. ‘From Cold War to Hot Peace’ Author Michael McFaul immediately took issue with the President’s approach to the meeting. “Improved relations” with Russia or any other country should never be the goal of American foreign policy. Instead , concrete objectives need to be defined, and then strategies for pursuing them – engagement, containment, isolation — need to be implemented. 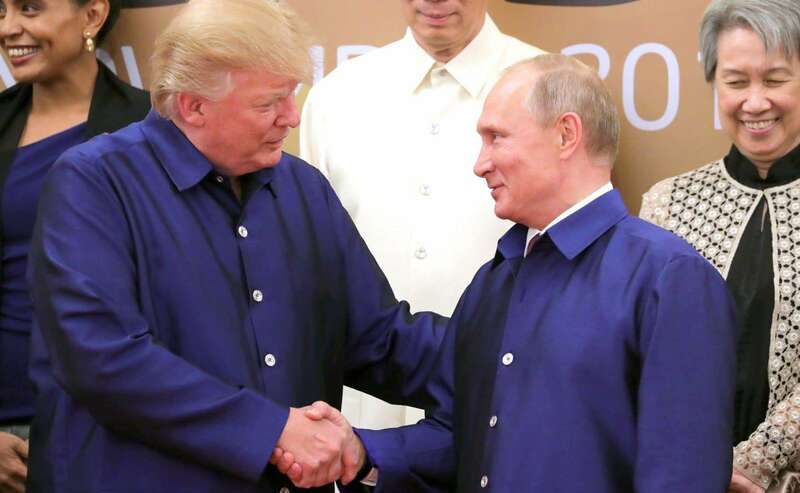 Trump meets with Putin just days after U.S. Deputy Attorney General Rod Rosenstein announced the indictment of 12 more Russians in the hacking of DNC email servers.